Jameis Winston and the Seminoles are seeking the program's first national title since 1999, while Tre Mason's Tigers are after their second in four seasons. In the end, the lobbying and the posturing didn’t matter. College football’s Darwinism sorted it out and left us with a matchup that is the fitting end to the BCS era. Twenty-nine days of buildup for No. 1 Florida State and No. 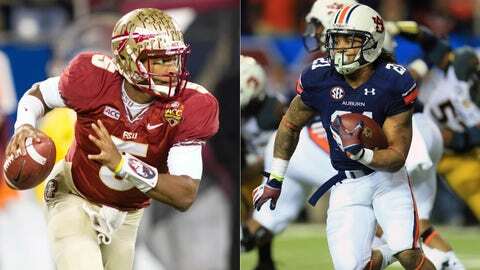 2 Auburn’s Jan. 6 clash in Pasadena for the national championship won’t want for storylines. There’s the SEC’s hopes of an eighth straight title rest in the Tigers’ hands; the Seminoles seeking a win that leaves no doubt that they have been reborn under Jimbo Fisher and brings back a measure of respect for the ACC. It’s a Florida State offense that has seemed unstoppable, winning by an average of 42.3 points behind the likely Heisman Trophy winner in Jameis Winston, who despite being a redshirt freshman and having dealt with a potentially life-altering legal investigation has been unflappable. Zero in on the stunning turnaround on The Plains, where Gus Malzahn took a team that went winless in the SEC and won the toughest division in the nation’s toughest conference, knocking off top-ranked Alabama in the process. But here’s why this is the perfect end to the 16 years of this maligned system: it’s the team that defined the landscape in its infancy vs. the conference that has dominated the last decade. "It’s very unique that the SEC, which is dominating now, Florida State which was in the first three National Championships ’98, ’99 and 2000 and all those national championship games, it’s kind of funny how it has come full circle like that," Fisher said. "I do appreciate the history of college football that way, and we all complained about the BCS and everything that goes on, but it’s funny how many times they get it right and how the history just keeps repeating itself." Seven years ago, the SEC’s run of championships began with a one-loss team with an offensive innovator of a coach that entered the regular season’s final weekend needing a miracle to reach the title game. No. 4 Florida got it, with No. 2 USC’s loss to UCLA lifting the Gators into the second spot in the final BCS Standings. The Seminoles, who appeared in the first three title games, are following a path we’ve seen them take before. In 2000, they opened at fifth in the BCS Standings (like this year’s team), were third after Week 10 (same for the ’13 edition) and climbed into position for a title game-spot by Week 13, which they wouldn’t relinquish (ditto for Fisher and Co.). Those Seminoles were led by a quarterback who set a single-season school record for TD passes in Chris Weinke, who tossed 33 that year in winning the Heisman Trophy. Fast-forward 13 years and Winston has already broken Weinke’s mark with 48 TDs and counting, and a Heisman seems a mere formality with the ceremony just days away. There is part of that ’00 title game Florida State would rather not emulate, as it fell 13-2 to Oklahoma. That loss was ultimately the beginning of the end of the Seminoles’ time atop the college football world as they appeared in the top three in the BCS Standings for just two weeks over the next 12 years — until this season. The BCS’ past will be on full display in the Rose Bowl, but what will it signal? Is this the dawn of a return to prominence for a team that stood as a power before the BCS’ arrival and thrived in its early days? Is it just the stage for another SEC celebration, further proof that it has mastered this system? That we’ll get a definitive answer is why we couldn’t have hoped for the BCS era to end any other way. "To play against the SEC, and the last one is probably appropriate because the dominance they’ve had now and the dominance that Florida State had earlier, it’s probably appropriate that these two teams are playing," Fisher said. The Spartans added one more shot of crazy to this inexplicably unpredictable season, knocking off No. 2 Ohio State 34-24 in the Big Ten title game. Win or lose, Michigan State was headed to the Rose Bowl for the first time since 1987 with the Buckeyes in the BCS title game. But the Spartans made the berth all that more satisfying as Connor Cook took advantage of a woeful Ohio State pass defense, throwing for 304 yards and three TDs. It’s worth noting that Cook, a Hinckley, Ohio, native, never even got a recruiting letter from Ohio State. There goes $17 million in a bowl payout and a strong case for a Heisman Trophy for Jordan Lynch. The Huskies saw any hope of a second consecutive BCS bowl berth go up in flames in a 47-27 loss to Bowling Green in the MAC title game, an uncharacteristic game from Lynch, who for the first time in 10 games had more turnovers (two) than passing TDs (two). He did more within 119 rushing yards of becoming the first 2,000-yard passing/2,000-yard rushing player — which he could hit against Utah State in the Poinsettia Bowl — and could still make the Heisman ceremony, but this was a costly game for Lynch, NIU and the MAC. Not a UCF game goes by without Twitter delivering some jabs on the contents of George O’Leary’s resume. But here’s something there’s no disputing: the man has done wonders in Orlando. He took over a program that had won 144 games in its first 25 years of existence and had zero bowl appearances and has led it to 71 victories and six bowls in 10 years, including this season’s spot in the Fiesta Bowl. Amazingly, the Knights are a three-point loss to No. 8 South Carolina from being undefeated. Needing only to beat erratic rival Oklahoma to clinch a Big 12 crown, the Cowboys’ defense failed them as the Sooners scored 16 points in the final 19 seconds in a 33-24 win that paved the way for Baylor to win the conference title. It also did little to sway the state of things in the Bedlam Game as the Cowboys dropped two straight, including last year’s overtime loss, and 10 of the last 11. Adding insult to injury, the Sooners are now heading to the Sugar Bowl to face Alabama behind the strength of this win. The last time the Owls won an outright conference title, ‘The Ten Commandments’ had just hit theaters. Rice brought an end to that drought, dumping Marshall 41-24 in the C-USA title game for their first championship since 1957 and it did it largely behind a defense that held Rakeem Cato and the Thundering Herd offense in check, holding them to 20 points and 142 yards below their season averages. The Owls are now headed to the Liberty Bowl, where they’ll take on Mississippi State. Home or away, the Sun Devils had no answer for Stanford. Losing 42-28 in their Sept. 21 meeting in Palo Alto, Arizona State hosted the Pac-12 title game and the results were even worse as it fell 38-14 and is resigned to playing Texas Tech in the Holiday Bowl. The biggest reason? With Marion Grice unavailable and D.J. Foster injured, the Sun Devils simply didn’t have the weapons to keep Stanford from controlling the game and the temp at the line of scrimmage. Arizona State was outgained 138-240 on the ground and averaged just 3.2 yards per carry to the Cardinal’s 5.5. In the 21-year history of the SEC title game, no one has had a performance quite like Mason did against Missouri. He ran for four TDs and 304 yards — eclipsing Justin Vincent’s ’03 record by 103 yards — and racked up 46 carries, 31 more than Jamal Lewis had in 1997. It remains to be seen if Mason’s late push, which included 868 yards and 13 TDs the last five games, will enough to get him on enough Heisman ballots to reach New York, but no one made more of the last weekend of the season than Mason did. Out the previous week vs. TCU with an abdominal injury, Morton loomed large as the Bears claimed their first outright conference title since 1980 when they were in the Southwest Conference. He picked off Texas’ Case McCoy twice, one of which he returned for a 60-yard TD, but the play was ruled dead at the 3-yard line when as Morton was penalized for showboating. He also had three tackles and two pass break-ups in the win. Dustin Hopkins’ place in ACC history didn’t last long. With a 45-yard field goal in the first half of the conference title game win over Duke, Aguayo broke Hopkins’ single-season league and school scoring record of 140 points. The Groza Award finalist was 6-for-6 on point-afters in the win, giving him 147 points on the season. Points will be at a premium in The Granddaddy. Pac-12 champ Stanford has held opponents to 14 or less four times in the last seven games, never giving up more than 20 in that span; Michigan State has won nine straight and allowed six points or less five times and limited Ohio State to 24 in the Big Ten title game. The Spartans are the higher-ranked unit — No. 1 in FBS, while the Cardinal are 15th — but Stanford is the more tested of the two. It has faced four offenses ranked in the top 10 at the time of their games in No. 2 Oregon, No. 5 UCLA and No. 8 Oregon State and while Michigan State has faced two such teams, No. 6 Ohio State and No. 8 Indiana and only one of them is bowl-bound. So which offense will break through? QB Connor Cook and the Spartans impressed in knocking off the Buckeyes, but the Cardinal are more balanced with Kevin Hogan (2,487 yards passing and 20 TDs), RB Tyler Gaffney (1,618 yards and 20 scores) and versatile WR Ty Montgomery (1,618 yards of offense and 126 points). The buildup will likely surround the QB battle of Bryce Petty vs. Blake Bortles and two teams making their BCS game debuts, but this really boils down to one question: Can the Golden Knights disrupt the Bears offense? UCF is yielding 19.6 points per game (13th) and is 19th in total defense (346.3), but it has looked far worse at times, giving up 581 yards to lowly Temple, 490 vs. South Carolina, 455 against Penn State and 445 vs. Louisville. None of those offenses are as explosive as Petty and Co., who should dominate this one. Remember, it’s not about the best matchup; it’s about getting buts in seats and generating revenue for the host city. As great as a Crimson Tide-Oregon clash would have been there — filling the desires of those of us who that that game would be for a BCS title — the Sooners are closer and they have a rabid fanbase that travels. That won’t help the outcome, though. Oklahoma doesn’t have a consistent passing attack to keep Alabama’s fifth-ranked D from loading up against the run and we’ve already seen the Sooners give up at least 445 yards three times. Alabama will simply overwhelm them, though it should be fun to see Bob Stoops reminded of all those shots he took at the SEC in the offseason. It’s called karma, Bob. The Tigers and Buckeyes have met just once before, and expect to see plenty of the lasting moment from the 1978 Gator Bowl as Woody Hayes punched Clemson linebacker Charlie Bauman (see above), leading to the end of the legendary Buckeye coach’s tenure. This edition should be explosive for more positive reasons as the Tigers have allowed an average of 476 yards against ranked opponents and Ohio State’s pass defense is ranked 102nd in FBS (259.5). Tajh Boyd and Braxton Miller could put on a show, but the nod goes to the Buckeyes, who with Miller and RB Carlos Hyde at least have the ability to control the clock behind their fourth-raked rushing attack. With an average margin of victory of 42.7, the Seminoles have romped, routed and rolled their way to Pasadena. Meanwhile, we’ve seen Auburn win by overwhelming opponents (see the SEC title game), we’ve seen them rally (vs. Texas A&M) and win in miraculous fashion (vs. Georgia and Alabama). There’s something to say about being tested and needing to find a way to win, which Florida State hasn’t had to deal with amid its run. But there are no holes on the Seminoles roster, ranking in the top 10 in FBS in 15 different major statistical categories on both sides of the ball, and while the Auburn running game will have success, Florida State’s overall balance will be enough to end the SEC’s streak.